MSV: Did Terry Castellano really tell people to protest at the mayor's home? Did Terry Castellano really tell people to protest at the mayor's home? The question has been raised since it appeared on Hoboken Patch as the first comment on a story HHA residents would protest against its commissioners Dave Mello and Greg Lincoln for not backing Executive Director Carmelo Garcia's appointing powers. Did Councilwoman Terry Castellano tell people to go protest at the mayor's home? Did Councilwoman Terry Castellano tell HHA residents to protest at the mayor's home? Many people couldn't or didn't want to believe it but the comment stood as the first on the story as authentic into today and has not been taken down, convincing some Castellano has gone rogue nasty blogger. Back in 2009, then mayor Peter Cammarano saw a protest of Hoboken residents rise up and protest on his block when he refused to resign after the FBI released details of his comments when he accepted $25,000 in illegal campaign contributions from a phony developer. The seriousness of the charges and Cammarano's arrogance who refused to resign after he said opposition to him would those people "ground into powder" nevertheless saw a small vocal minority complaining residents were acting inappropriately in having a protest on upper Bloomfield Street. In that instance, Cammarano had left town with his family but yesterday the announcement of a protest by a spokeswoman from the HHA office was a clear sign the action was directed by Executive Director Carmelo Garcia. The Sky Club home to the families of both Mello and Lincoln did not see a large protest in the end scheduled for late afternoon. A group of several dozen HHA residents appeared two hours later to no great effect. Residents of the Sky Club off the record found it less than amusing but several reportedly inquired to Dave Mello about the matter finding it grossly inappropriate. 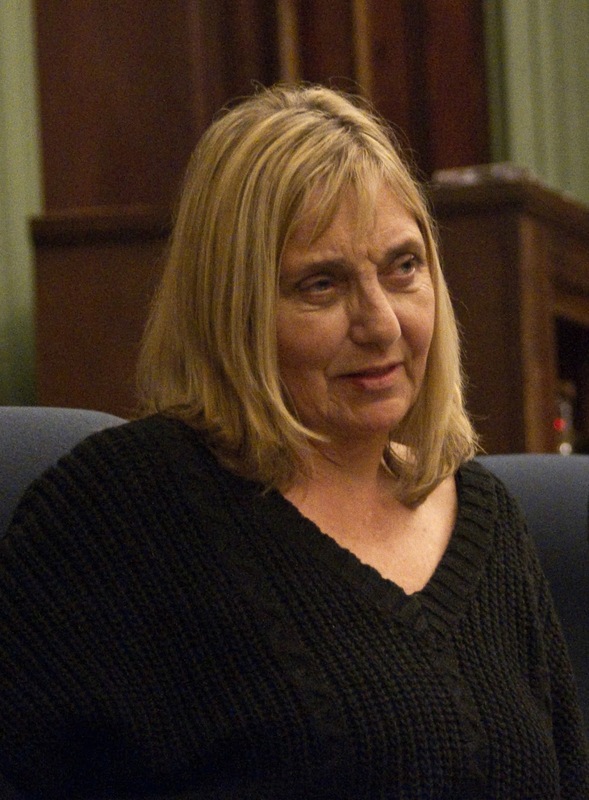 Terry Castellano is somewhat infamous for her efforts saying almost a million dollars in parking meter quarters was "cleared up," three times back in 2007 when then director of the Parking Utility John Corea looted the bounty and sent it to a south jersey mob connected firm. Questions as to why both she and her cousin, Councilman Michael Russo fought to cover up the missing million dollars has never been satisfactorily answered although they've upgraded their answers in council meetings last year blaming former Mayor Dave Roberts for misleading them with inaccurate information. John Corea was sentenced to a seven year stretch last year for his role in the theft. if a comment appearing first out of the gate on Hoboken Patch is accurate. Talking Ed Note: This is a shocking development by Terry Castellano who has submitted a defense of the Mason family lawsuit against Hoboken people to appeal the legal appointment of Jim Doyle early this year to the Mason sponsored cybersewer Hoboken411. Unlike Hoboken411, Hoboken Patch does not have a Nazi like censor to protect the Old Guard's misinformation. Castellano's remark was not received well with one commenter replying in response, "Just when we all thought you couldn't disgrace your elected office any further, you make a liberlous remark against citizens on an unpaid board and recommend that a mob go to the mayor's house."